Cougars, also known as mountain lions, pumas and panthers are pretty much everywhere these days. Seeing one traipsing through a suburban neighborhood on the news usually sends people into fear mode. Although cougar attacks on humans are rare, there are some general principles that can help you stay safe. Cougars are predators, feeding mostly on deer. Deer and other small game are most active at dawn and at dusk. These are also the times of day when most people go for a walk or a run. Cougars, like all other wild animals, do their best to avoid humans. It is only when they think that humans are prey that they attack so common sense and awareness are your biggest allies. It’s important to remember that cougars do not see and interpret things the way we do. They tend to look for shape and movement. So yes, they will usually attack a jogger before someone strolling along. Think of your house cat and how he easily becomes bored after the mouse gives up. 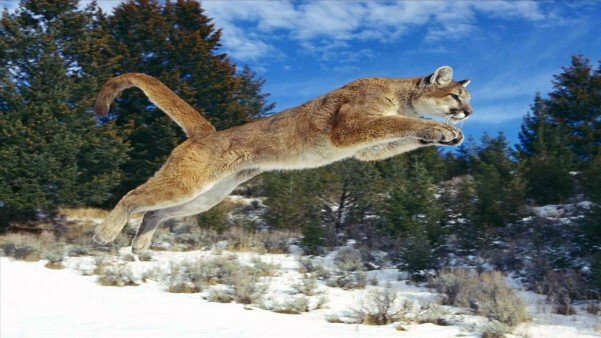 So obviously, if you ever do encounter a cougar, it’s vital that you do not run (unless you can run faster than 45 miles an hour). It’s been suggested to wear bright or contrasting colors when taking your evening stroll. Although cougars can’t see color like us, they do recognize dark or mid-tone colors because that’s what their prey looks like to them. Making noise is also another way to let Mr. Cougar know that it’s a human coming through his woods. It is also a suggestion that we keep our pets on a leash but what fun is that for Fluffy? I’ve had two encounters with cougars while walking my dogs (they don’t know what a leash is) and they instinctively knew a cat was around before he appeared. The first time, one of my dogs ran straight home and hid under the porch while the other stood there shaking and growling. The cougar backed off when I yelled at him. Horses do the same thing so be aware of how your animal is acting. Awareness is always the best tool to have when you venture out of suburbia. Strapping on the old earbuds and turning up the music while you work on firming up those buns is not awareness. It’s very important to know that cougars attack from behind so you’re upping your odds if you can’t hear the woods. Cougars tend to take the easiest path while getting from place to place. Learn how to identify their tracks which are very different from dog tracks. Remember, you are in their home and they only have instinct to rely on. Almost all encounters end up with the cougar retreating. They want to preserve their own lives too — humans are not part of their food chain. Look around, be aware to possible signs, Make noise while in thick cover and don’t be afraid. Cougars aren’t waiting in the bushes for humans to come along. Lastly, if you do have an encounter, and the cat acts aggressively (remember, he could think you’re a predator), make darn sure you stay put, yell, scream, grab a rock (rocks hurt and deer don’t throw rocks), raise your arms, wave your jacket around and act aggressively. Believe me, he wants nothing to do with you, he just wants deer for dinner. He’ll move on.